Today's issue of "Russian reporter" journal, which compiled a rating of the ten most successful ethnic musicians, had a pleasant surprise for fans of Tuvan music. The boom of ethno-music or "world music" took place in the entire world in the 90's; the main supplier of stars of this genre to the world scene turned out to be the disintegrated Soviet Union. As the author of the material, Natalia Zaitseva, believes, this was due to a coincidence of two factors: the fact that the borders opened, and a search for national identity of the populations of the former empire. At the same time, national traditions, which grew from the fragments of USSR, often first developed in the West; then the musicians by origin from the former Soviet republics toured in Russia - already in the capacity of stars from abroad. His way of throat-singing performance is unique to such an extent that it is unmistakably recognizable, just as Soruktu Kyrgys, Ak-ool Kara-Sal, Maxim Dakpai, Kyzyl-ool Sanchy, Khunashtar-ool Oorzhak, Gennady Tumat, as well as many others among our prominent khoomeizhis were unmistakably recognizable. The it was impossible to mistake the performance of each of these khoomeizhis with that of anybody else. It is precisely the recognizability and uniqueness of the manner of performance that is the most highly prized quality of traditional khoomei, which, unfortunately, is being gradually lost in our times. 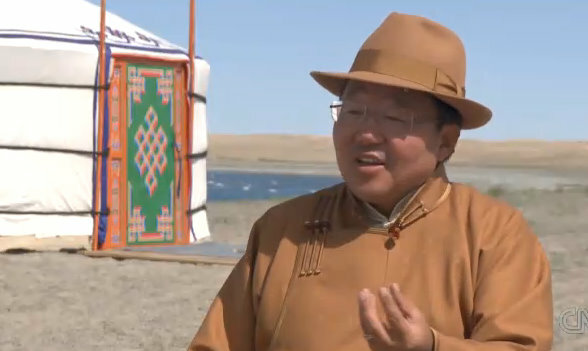 President Elbegdorj has walked in the steps of his country's history. Greetings with the Day of Knowledge and with the new issue of our Journal! Dear friends! Our greetings to all those who strive for knowledge, with the holiday that starts off the new school year! We are happy to announce the release of a new, double issue 2-3 of our publication. As usual, we present articles on the subject of ethno-social problems by our permanent authors, as well as on various aspects of Tuvinology. New authors with new approaches to problems appeared as well, which will definitely prove to be interesting to tuvinologists. 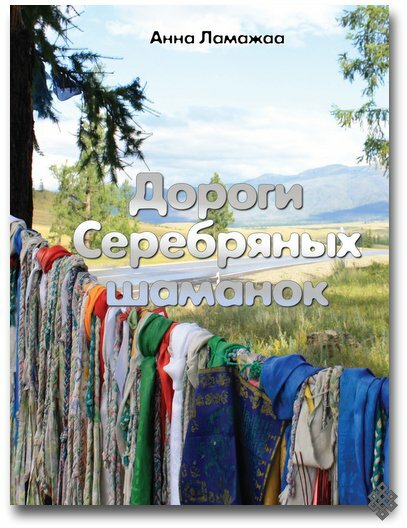 In this double issue, you will be able to read materials devoted to the 90th Anniversary of Tuvan Statehood, (a conference to be held), as well as of past academic forums: ethno-sociology seminar in the framework of the work of the 9th Congress of Russian Ethnologists and Anthropologists, and a Tengrianism research conference. Students of the IIMK team led by V. A. Semyonov and M. E. Kilunovskaya opened a burial at Eki-Otuk site. 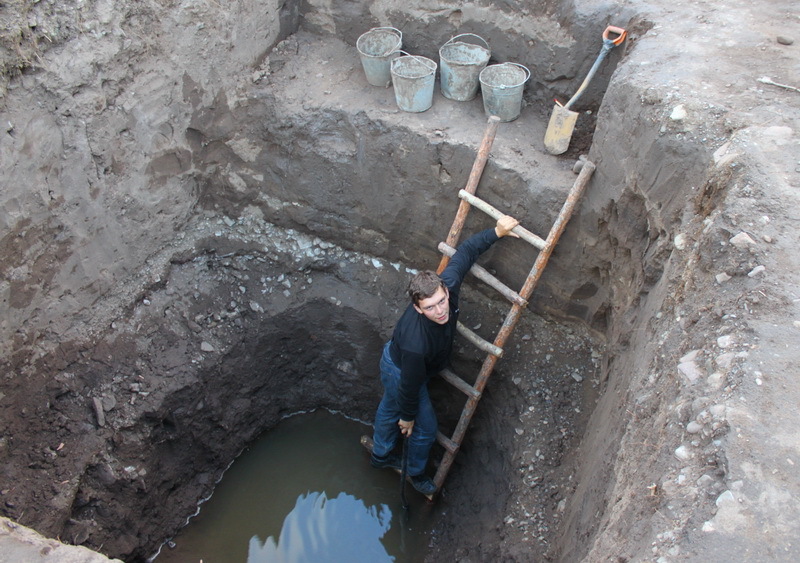 The work was conducted in unusual and even extreme conditions; an underground river flows right through the burial - one of branches of river Eerbek , which flows along all the digs on the surface. During investigations of this burial, a Chinese buckle was found with an image of Teo-te mask. Presumably the find can be dated to 19th-6th centuries before our era. It needs to be noted that this is the first time in his lengthy working experience that V. A. Semyonov has seen a buckle of this type in Tuva. Kaadyr-ool Bicheldei: "We are praying that they don't find gold here"
Everybody wants to know what was found during the digs in Eerbek district. After the sensational finds in the Valley of the Tsars, many want to know if these burials also contain gold. What did they find, and what are the most valuable finds? Gold is not that valuable. No matter how strange it sounds, it is true. 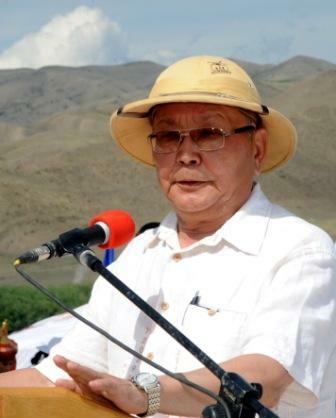 Kaadyr-ool Bicheldei says: "We are praying that they don't find gold here. Gold is always a problem and it attracts unhealthy interest. " Gold served ritual purposes or else it was simply an adornment - that is all. The material culture is much more interesting. To reconstruct the epoch, to visualize the life of the Scythians, one has to find work tools and armor. Our republic is rich in natural water therapy (balneology) resources. To date, more than 100 water springs and water bodies have been identified, that have some degree of therapeutic properties. Every year several tens of thousands of people undergo therapy at our arzhaans. The phenomenon of "arzhaan therapy", which has been a fundamental component of the culture and tradition of Tuvan nation since the most ancient times, is a unique phenomenon preserved on a large scale only in Tuva among SNG countries and Russia. 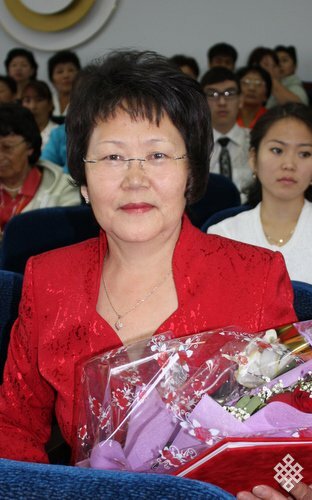 On the eve of the official start of the next mass season of therapy at the arzhaans, we decided to talk with one of the few researchers who specialize in the study of hydromineral resources of Tuva, candidate of chemistry, K. D. Arakchaa. Publishing house "Voskhod-A" in Moscow just released a new work of a Tuvan physician and writer, Anna Lamajaa - a novel "Paths of Silver Shamanesses" (M. 2011). The work is devoted to the hard life of one f members of an ancient shamanic lineage of Tuva - the family of Silver Shamanesses, and its members in 20th century. Traditional existence of Tuvan nomads is shown, and changes resulting from transition to settled way of life; Soviet realities of life in Tuva and new changes in the lives of Tuvan population associated with reforms of the 1990's . All these events obtain new meaning when seen through the veil of the mysterious, mystical worlds inhabited by the main heroine - the heiress of the shamanic lineage, and other people with extraordinary abilities. It is the only place where it is possible to see and obtain felt products and souvenirs made in various corners of Russia and Mongolia. Ministry of Culture of Tuva is the organizer of the contest, with financial support of Ministry of agriculture and provisioning of Republic Tyva. Master craftsmen from Republic Altai, Bashkortostan, Khakassia, as well as from many districts of Mongolia will participate in the festival. 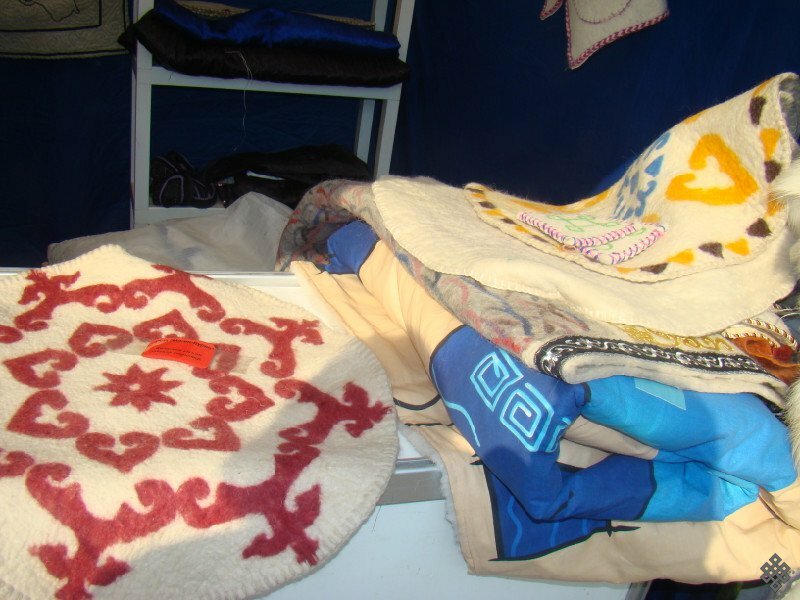 An exhibition and sale of yurts will be organized, a fair of folk industries products, felt-making workshops by Tuvan, Khakass, Altai and Mongolian artisans who have preserved traditional methods, of production, and decoration of souvenirs. There will be a contest for the best felt artifact, the best presentation and the best yurt. At "Aldyn-Bulak" ethnocultural complex, tomorrow at 19:00 hours, there will be an official presentation of a statuette of "Green Tara" Goddess by Sainkho Namtchylak to the 'Aldyn-Bulak" complex. 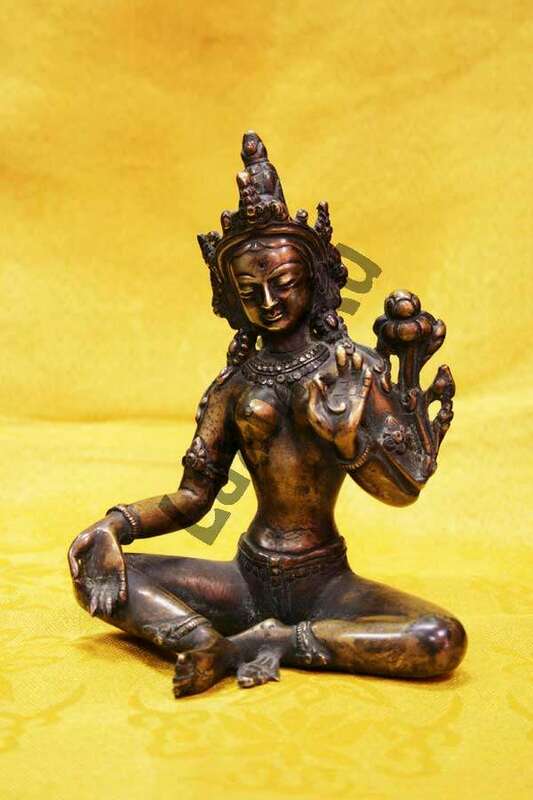 The ancient statuette of the Goddess has traveled through the largest monasteries of the Buddhist world, and finally will receive a place of honor at "Aldyn-Bulak". Green Tara is a beloved goddess of the Buddhists. She brings freedom from sorrow, poverty and pain, brings joy and destroys evil. Visitors may touch the holy statuette and ask for help for themselves and their close ones. 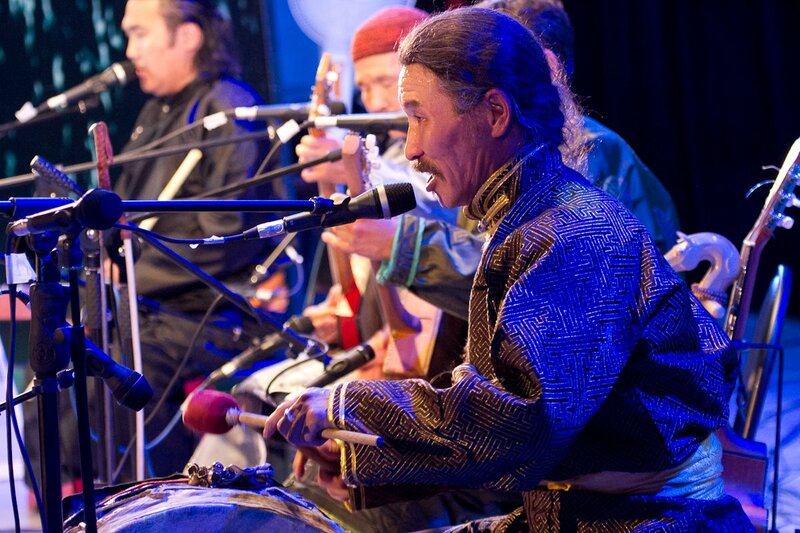 This event so significant for Tuva will be associated with a concert performance by the national artist of Tuva. 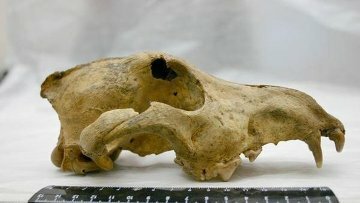 Scientists have determined that the most ancient domestic dog of Asia, as known up to date, lived about 34 thousand years ago in Altai, as the Center of public relations of Siberian section of RAN announced. The conclusions of Siberian scientists were published on Thursday in the scientific journal PLoS ONE. This dog skull was found in Bandits' Cave in Ust-Kansk district of republic Altai back in early 1970's. At that time scientists concluded that the find is about 18 thousand years old. In 2008 scientists requested their American colleagues at University of Arizona to perform a mass-spectrometer dating of a bone fragment from the skull; the lab established that the remains are about 34 thousand years old. 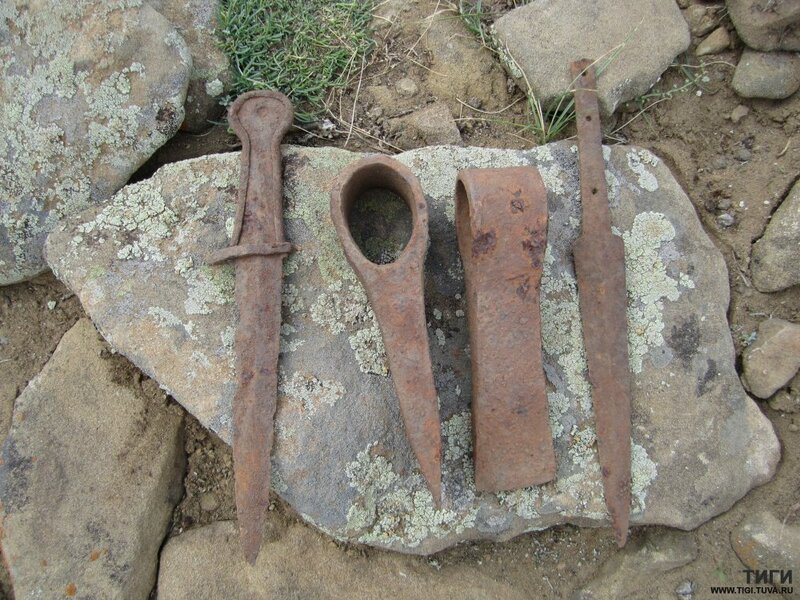 During the work of the field team No.1 of the Sayan complex expedition at Bai-Dag-1 cemetery (in the construction zone of Kuragino-Kyzyl railway), in the largest of the kurgans of this system, unique objects were found - two iron daggers and two iron axes. This information was confirmed by Director of TIGI K. Bicheldei and expedition member S. Skobelev. All four objects were found in the upper part of the kurgan, closely adjacent to one another. Their state of preservation is very good. These objects may date to the last centuries before our era. This find may help with more accurate dating of this burial complex, as well as cultural affinity of these artifacts; because previous finds of similar artifacts were known, predominantly, from a number of random finds. The discovery of these rare objects happened thanks to the attention to detailed work by the participants of the expedition, members of two colleges - TuvGU and NGU. Interest in ancient shamanic practices is growing with every day. Alarmed by ecological catastrophes, disillusioned in contemporary society, and having accumulated a substantial number of philosophical questions about life, a person looks for answers in his true roots - in living nature. It is believed that with the help of multiple shamanic techniques, it is possible to enter the world of one's subconscious, heal disease, and to avoid losses and failures. 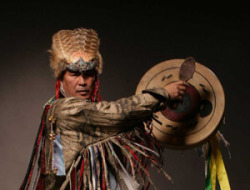 But is shamanism really as powerful as people say? We decided to ask a man who experienced the mystical "power of nature" in practice - Stanislav Shaposhnikov, physician-psychotherapist, and a student of the singing shaman Nikolai Oorzhak. Archeologist Yuri Teterin discovered several artifacts also dating to Early Scythian period - 6th - 5th centuries before our era. Among the finds were a bone pendant in the form of a moose hoof that served as decoration of clothing. The pendant was crafted in a special way: its surface was covered with ornamentation suggestive of the animal's hair. It is an old truth: if you can't find something, you should look somewhere else. It is the prose of life: it is useless to look for your keys in your purse, if you have left them at home by the mirror, and it is useless to look for your cell phone in your pocket if you have left it in the store. And it is totally useless to search for Genghis Khan's tomb where it is not. But where should you search? Not anywhere! 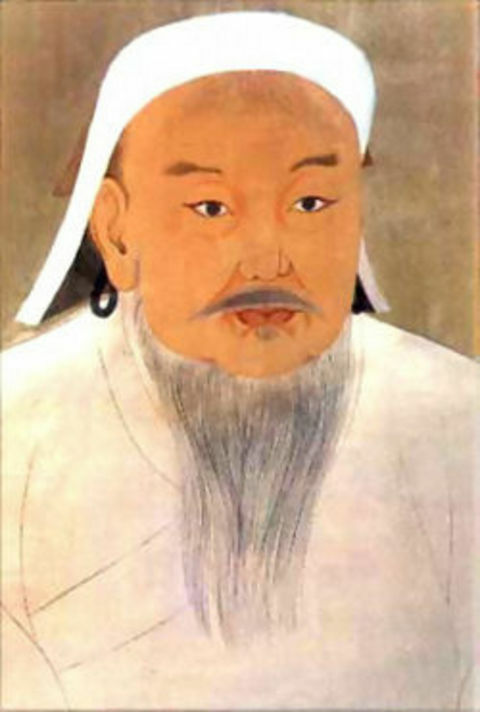 Mongols have already dug up everything possible in their country, and nothing. It is the same story with the Buryats. One of the traditions states that the great conqueror was buried where he was born. That means Delyun-Boldok valley. The area is quite large - it includes Aginsk Buryat circle, Onon district, it crosses Russian-Mongolian border, passes through Dadaliy sumon (administrative unit of Mongolia) Khentei aimak (district), and terminates in the area between Selenga and Onon rivers.